It’s very family focused, containing lots of useful hints and tips on things to do with children. The ‘Great Places for Free’ section of the guide gave me some new idea’s for free days out and free activities to try – always handy as 3 children can equal a lot of money! The guide contains a large pull out map as well as several road maps in the back of the guide, making orientation easy. Barcelona guide: “Sam and I both remarked that it was really good fun to “get lost with a purpose” and that’s exactly how following this discovery tour felt – there was no marching from one location to the next, instead we got to take each destination at our own pace and amble around some areas of the city that were totally new to us. 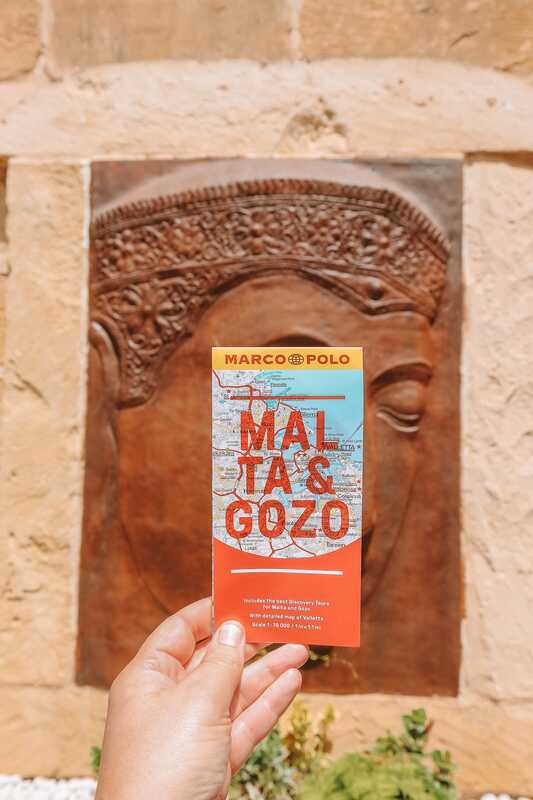 Malta & Gozo guide: “A few weeks ago, the gang at Marco Polo Guides asked if we wanted to try scouting out some of their tips on our next trip (which piqued my interest straight away). Using their Malta and Gozo guide we decided to search for some of the ‘insider tips’ on the best things to do in Malta. Suffice to say, I’m a real sucker for insider tips… Essentially, anything that means I get to make the most of my time on the islands (like those insider tips featuring some of the lesser-known spots in Malta and Gozo) is an opportunity I’ll always jump at while travelling. Devon and Cornwall guide: “There were no surprises for me, the guide includes everything that you would expect (speaking from a Cornish perspective), you’ll find all the most popular, picturesque and must see places but I was delighted to find some added extras too. Find our full range of guide books and maps here on Amazon. What is your favourite Marco Polo travel guide? Something to say? Leave a comment below, tweet us @MarcoPoloGuides or tell us on Facebook. Easter is only two weeks away, and there is still time to book a last-minute trip to catch the first April sun in one of Marco Polo’s favourite Easter holiday destinations! Don’t forget to check out our Spring giveaway at the end of the post, for a chance to win 5 Marco Polo Pocket Guides of your choice and a FujiFilm Instax Mini 9 camera! Rome is perfect for a true Easter experience. Easter can be one of the busiest times to visit the Eternal city, but in recent years many people have taken advice not to visit at Easter, so there are plenty of hotel rooms to be had at reasonable prices. To hear the bells of St. Peter’s Basilica ring on Easter Sunday is an unforgettable experience. Those not too keen on the spiritual can benefit from free access to all of Rome’s archaeological sites and museums, as the first Sunday of the month falls on Easter Sunday this year. Though do be sure to pack your umbrella, as April tends to be one of Rome’s rainier months. Not willing to risk the rain in Rome? Then why not head over to Sri Lanka? April is one of the best times to visit Sri Lanka, as the peak tourist is winding down before the monsoon season’s arrival in May. Sunshine, warm weather and beaches – not to mention the beautiful nature and fascinating wildlife – make sure that nobody misses the chocolate eggs. Whether you decide to stay in one place, or travel around the island, Sri Lanka will not disappoint. Vienna is a great destination for an Easter break. While many locals head for the ski slopes, the city caters to those who stay – or arrive – with a multitude of Easter markets, chocolate and rabbits everywhere. Visit the Schönbrunn Easter market for some beautiful handcrafted souvenirs or take the children to the Prater area for some fun including the famous giant ferris wheel. Don’t forget to try Osterpinze, a local bread like pastry eaten during the Easter holidays. Another guaranteed destination for sun is Cape Verde. The archipelago off the coast of Africa is a perfect alternative to the more familiar Canaries. The weather is a lovely and warm, and April is the ideal time for whale-watching. Also, there are some lively Easter festivities to be seen, as the locals ring in the Easter Sunday with a big party. If a six-hour flight is not your thing, Barcelona is a good choice. Sure, the museums and shops have slightly awkward holiday opening times – mainly on Easter Monday – but there are still places that cater to the tourists. Be sure to check out the main Easter parades and processions on Good Friday, and on Easter Sunday you should stay in the vicinity of the Barcelona Cathedral – not to be confused with Sagrada Familia – for a true Barcelona Easter experience. To celebrate Spring, Marco Polo is organising a giveaway! We are giving away a set of 5 Marco Polo Pocket Guides of your choice and a Fujifilm Instax Mini 9 camera to one lucky winner, chosen at random. Simply share the story of your most memorable Easter / Spring travel moment in the comments below. You can earn more chances to win by liking our Facebook page and by following our Twitter and Instagram accounts and by letting us know in your comment that you have done so. The competition is open from Thursday 15 March 2018 until Thursday 29 March 2018 at 12:00 GMT. We will contact the winner personally via email using the email address used to leave the comment so make sure to check that it is spelled correctly! The promotion is open to UK & European residents aged 18 or over, excluding employees and their immediate families of Marco Polo, its agents or anyone professionally connected with the promotion. To enter, simply comment on the blog post. Additional chances to win may be acquired by liking the Marco Polo Facebook page and by following the Marco Polo Twitter and Instagram accounts. If the entrant has done any of the mentioned actions, it should be stated in the comment. This competition will commence on 15 March 2018 and all entries must be received by 12.00 GMT on 29 March 2018. The Promoter accepts no responsibility for any entries that are incomplete, posted late, misdirected, and incorrect, garbled or fail to reach the Promoter by the closing date for any reason. Entries via agents or third parties are invalid. No purchase necessary, however internet access is required. The Prizes: 1 x prize winner will receive 5 Marco Polo Pocket Guides of their choice and a Fujifilm Instax Mini 9 camera (RRP £64.99). The prize must be taken as stated and no compensation will be payable if a winner is unable to use the prize as stated. The winner will be liable for all costs and expenses not stated relating to claiming or partaking of the prize. The promoter may substitute the prize for a prize of an equal or greater value if, for any reason the original item is unavailable. By entering, winners agree that if they win they will participate in any reasonable publicity arranged by The Promoter or its agencies. By entering the promotion entrants confirm that they have read and agree to be bound by these terms & conditions and by the decisions of the Promoter, which are final in all matters relating to the promotion. Failure to do so will result in the forfeiture of the prize. No correspondence will be entered into. The Promoter or its agencies accept no responsibility for any loss or damage suffered through acceptance of the prize. The Promoter or its agencies will not be responsible for the non-inclusion of entries as a result of technical failures or otherwise, including any such failure which is within the control of The Promoter or its agencies. Proof of submission of entry is not proof of receipt of entry. The Promoter reserves the right at its sole discretion to disqualify any person it finds to be tampering or to have tampered with the operation of the promotion or the Marco Polo website, or to be acting in violation of these terms and conditions. Calling all trailblazers! Marco Polo has never been one to follow the crowd: since we burst onto the scene in 2012 and turned the travel publishing world upside-down, we have been pursuing a quest to create the best travel guide possible ever since! And now we are launching 30 ground-breaking new look pocket guides for 2018! • Each book has 4 to 5 exciting, specially tailored tours helping readers get behind the scenes and head off the beaten track. • The perfect planning tool – each tour has an overview box detailing the start and end points, distance, plus timing and costs involved – all the information an explorer needs at a glance! • Each tour is plotted on an overview map highlighting the start point and final destination for easy orientation. relaxing stops along the way. Free touring app! The Discovery Tours are also available as an app – simply download any of the tours from the web link / QR code featured in each guide. The ultimate navigational tool to enjoy stress-free sightseeing. Ground-breaking new look covers bring the guides bang up-to-date, so you won’t need to be shy about looking like a tourist! Fresh, simple, cool – the split line typography is designed to make you look twice and the bright colours will get you in the holiday mood! The guides with Insider Tips! Showing the main sights in detail simply isn’t enough for modern-day travellers. Marco Polo specialises in getting you off the beaten track! Why follow the crowd when you can make your own path? Relaunch titles available Jan 2018: Amsterdam, Bali, Barcelona, Cambodia, Cape Verde, Corfu, Costa Brava, French Riviera, Hong Kong, India South, Italy, Lake Garda, Mallorca, Malta & Gozo, Mauritius, Montenegro, Munich, New York, New Zealand, Rome, Sardinia, South Africa, Sri Lanka, Tenerife, Venice, Vienna. Plus 4 brand new titles: Japan, Peru & Bolivia, Salzburg & Surroundings, Santorini. ORDER YOUR MARCO POLO POCKET GUIDES NOW. Let Marco Polo show you hidden gems, lesser-known locations and stunning viewpoints where you can make memories to last a lifetime. Brush shoulders with the locals, eat the food that Grandma makes and seek out unique experiences at every turn. Be a traveller, not just a tourist! It’s Day 9 of our Advent Calendar and today we are looking into a very peculiar tradition from… Spain! Did you miss yesterday’s post? Check it out here! Originally a Catalonian tradition but now practiced throughout Spain, a caganer is a small figurine of a man in the process of defecating. The caganer literally means the “crapper” and the figurines are featured in the traditional nativity scenes. There are many explanations for this tradition, but the most widely accepted one is that by defecating the caganers are quite literally fertilising the Earth and as such featuring the caganer in the nativity scene brings good luck. The figurine is usually depicted as a man dressed in traditional Catalan attire, though nowadays there are caganers – rather popular ones too – depicting celebrities and political figures, such as President Trump, or even the Pope. Needless to say, the caganer figurines are well-beloved, especially by children and adolescents. If you want to ensure a few good chuckles at your Christmas party, just bring a caganer figurine home when you next visit Barcelona! There’s no doubt about it: Barcelona (1.5 million inhabitants) is a place of fascinating contrasts. This major design metropolis with its award-winning post-modern buildings boasts the largest historic city centre in Europe after Naples, where you can lose yourself for hours. Sagrada Família is the world-famous symbol of Barcelona. Let the gigantic columns and spectacular interior of the huge nave consecrated by the Pope work their magic on you. Enchanting park with panoramic views: when creating the Parc Güell, Antoni Gaudí let his imagination run riot and revealed his universal genius as architect, landscape designer – and a pioneer of recycling. Enjoy the flair of the Mediterranean metropolis on one of its many squares with a coffee or a cool beer. Plaça de la Vila and Plaça de la Virreina in Gràcia are particularly atmospheric. Throw yourself into the crowd on the famous Rambla – tourists and theatre-goers, culture vultures and purveyors of kitsch souvenirs, dolled-up opera-goers and agile waiters. Blossoms, tendrils, dragon heads: if you want to experience Catalan Art Nouveau in all its glory, head for the Palau de la Música Catalana, the most ornate monument to modernism. At traditional castells, a popular sport in Catalonia, you are not only allowed to watch balance artists training – the courageous may even join in. Buy the Barcelona Marco Polo Guide. What’s the best thing you have ever tasted in Barcelona? Comment below, tweet us @MarcoPoloGuides or tell us on Facebook. You’ll be glad to hear that there’s a way to party away in the hippest clubs in town, such as the Shoko – for free! All you have to do is get onto the right guest list: one of the most popular is Shaz’s guest list: www.barcelonaparties.com. Watch out though: the invites are only valid for that specific time – latecomers have to pay up to €20. So get in line in good time, as long queues will form. A number of museums open their doors for free on Sunday afternoons from 3pm; amongst them the Museu Picasso (www.museupicasso.bcn.cat/en), the most visited museum in Barcelona and the Museu d’Història. If you choose the first Sunday in the month for your visit, you’ll have all day to explore for free. Marco Polo Pocket Guides around the world! “I’m gonna have to go into the map.” Photo credit: Hannah Shaw recreating the London map scene by Joey in Friends. Got a Marco Polo picture of your own? So the only question left is… Where to next? Marco Polo’s list of the top 10 things not to be missed in Barcelona! Our best recommendations – from the top down – help you to plan your tour of Barcelona’s most important sights. The magnificent architecture in the Gothic Quarter is a testimony to Catalonia’s golden age as a Mediterranean power. A maze of dark, twisting medieval streets and sunny squares lined with revered churches and lavish palaces. This cathedral with its gigantic towers winding their way skywards – which is still under construction today – has become the world famous symbol of Barcelona. Like people watching? The famous promenade teems with a mix of tourists, theatergoers and pickpockets, culture vultures and vendors, elegant opera patrons and harried waiters. Las Ramblas is a non-stop human spectacle. A flamboyant art nouveau concert hall – a lavishly decorated monument to Catalan Modernisme. The curved dome of the stained-glass skylight is uniquely beautiful. Serpentine figures, crooked arcades and doric columns: it is no wonder that even Salvador Dalí admired Gaudí’s fairy tale park with a breathtaking view over Barcelona. Gaudí’s strangest, and most famous, residential building has a remarkable rooftop landscape and a panoramic view. (Or Manzana de la Discordia.) Three of the main figures of Modernisme have created monuments next door to each other. The Casa Batlló, designed by Gaudí, is especially striking. Housed in five medieval palaces on the elegant Carrer Montcada, Barcelona’s most popular museum provides an unforgettable impression of the artist’s work. Catalonia’s art under a single roof – from the Romanesque period to the present day. The collection of Romanesque frescoes is unparalleled worldwide. Catalan Gothic in its purest form: the unique house of worship became famous all over the world through Ildefonso Falcones’ best-seller “Cathedral of the Sea”. Content taken from the Barcelona Marco Polo Spiral Guide. Have any comments? Tweet us @MarcoPoloGuides or tell us on Facebook.